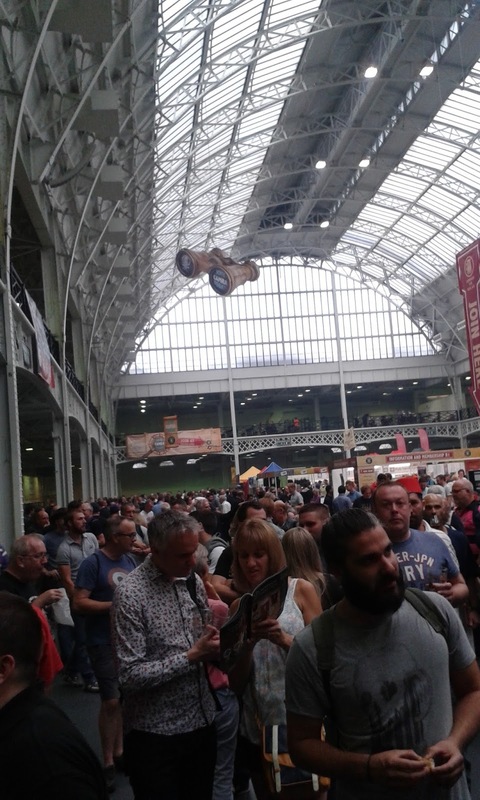 Whilst I was off doing wholesome things with Master, Miss and Mother JibberJabber Mr JibberJabber enlisted the support of the menfolk of the family, namely Father, Brother, Uncle and Cousin JibberJabber, to go off to a beer festival. Here's his report of the day. "When Mrs JibberJabber recently took the Junior JibberJabbers on a tour of the London museums I was given the chance to visit CAMRA's show piece event - The Great British Beer Festival, an opportunity I grabbed with both hands. 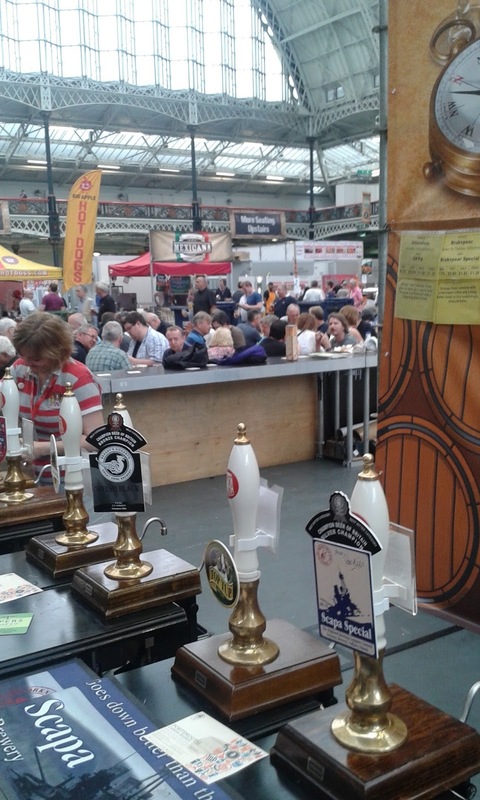 I have been to numerous beer festivals, of all different shapes, sizes and quality. I have really enjoyed some of the smaller local festivals, where I have been introduced to a variety of local ales. I remember one in particular, where I spent the afternoon riding steam trains beer in hand. Taking place in mid August, the Great British Beer Festival brings together the best of the hundreds local events into one behemoth of a beer festival. Over recent years, due to the redevelopment of the Earls Court area, the event has taken place at Kensington's Olympia. Olympia's lofty exhibition halls, and impressive arches provide a spectacular venue for an event of this scale. This is no small event. Hundreds for beer pumps line up along many regional bars. The variety is staggering ranging from tiny island micro breweries to well known brands with large show piece themed stalls; be of no doubt if you like real ale there is something here for you. The event opened at twelve noon, tickets were available on the day, but as this is a really busy festival I would recommend booking in advance via the Camera website. On arrival you are directed to the glass collection point. Festival beer glasses, in pint half or third of a pint size are available, for a small deposit. 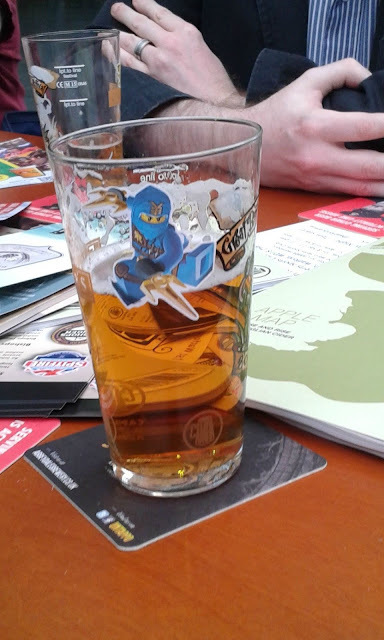 I personally favour the half pint, which this year was priced at £3. At the end of the day you can return your glass and redeem your deposit, or swap your glass for a clean one if you want to keep it as a memento of the day. 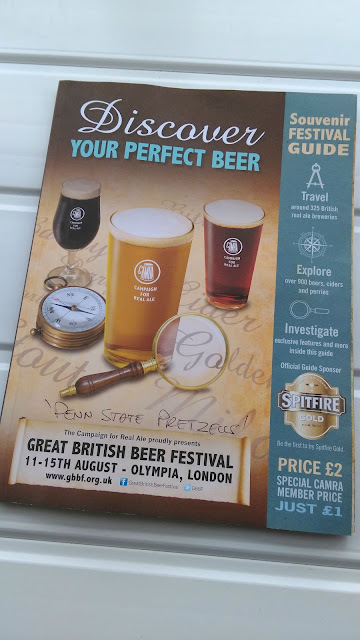 I would also suggest buying the event programme (£2 or £1 if you are CAMRA member) as it includes all of the information you are likely to need including a directory of the breweries and beers with the all important tasting notes, and a floor plan showing where everything is. The group I spent the day with had eclectic tastes. We decided that we would buy beers in rounds and that whoever was buying the round would choose the beer we would all try. This meant that we tried a number of styles of beer ranging from a traditional 'session' beer to some of the more unusual milds and stouts - I enjoy this tactic, although it's not for everyone, you have to accept that every so often you are going to get one that's not for you. 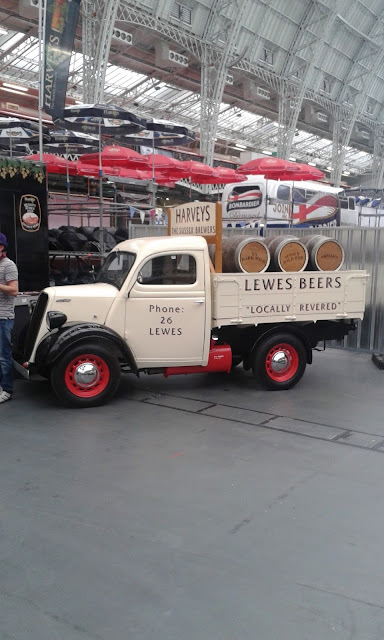 On this occasion I came away happy, as over the course of the entire day there was only really one beer I didn't enjoy. 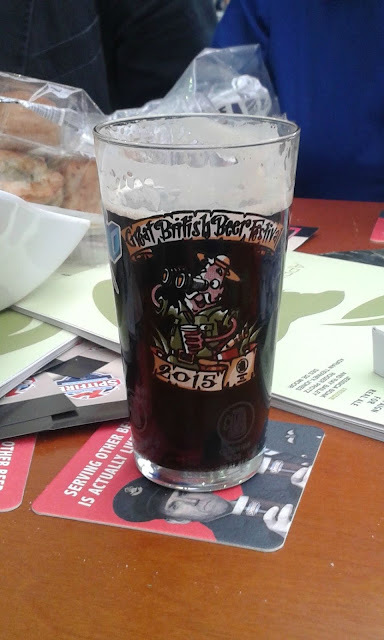 A particular highlight was a very tasty Black Cherry Stout. In between rounds I took the opportunity to wander around the event taking in the atmosphere. There is a real festival atmosphere with live music, food stands and stalls selling a variety of memorabilia. Thursday was 'wear a hat day' but when I visited on Friday it seemed that many had extended this theme. I joined in buying a cricketers hat, in celebration of the recent Ashes victory. Like many of CAMRA's beer festivals the event depends on the assistance of volunteers, and with the number of bars and beer pumps on display here, a large workforce is order of the day. 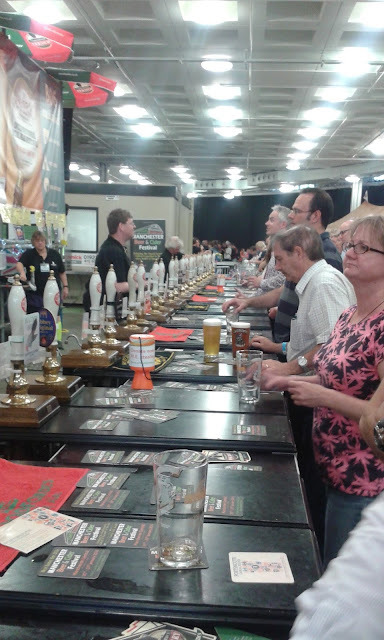 Typically the volunteer roster comes from within the CAMRA membership, meaning that that your barman or barmaid are happy to help and accommodate. If you are not sure what to choose, from the staggering number different ales, then if you ask you will be steered in the right direction. 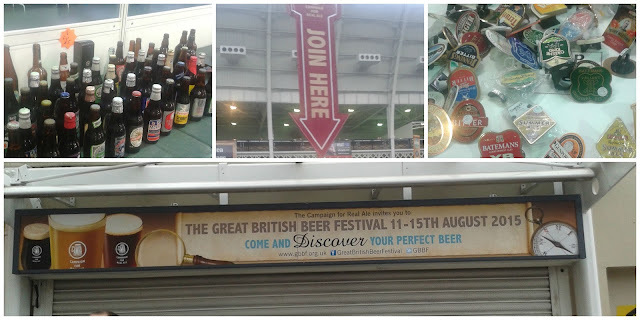 As a fan of real ale I had a fantastic day out at the Great British Beer Festival and I would heartily recommend a visit. The only downside - the hangover the next day." 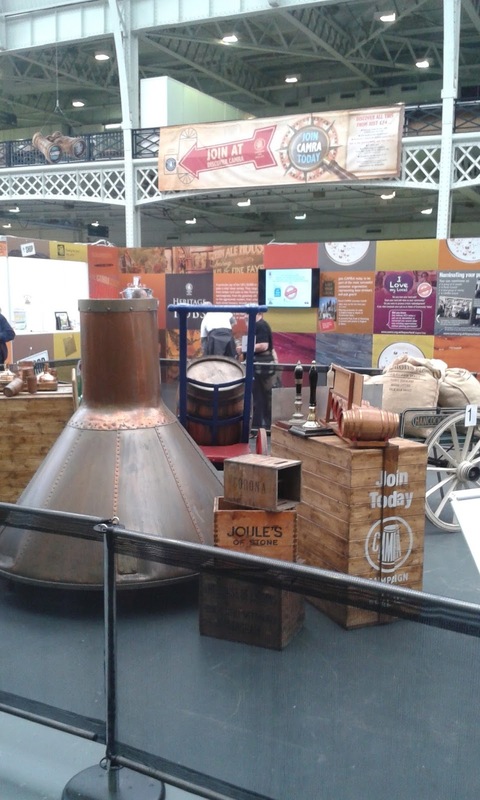 Are you a real ale fan? 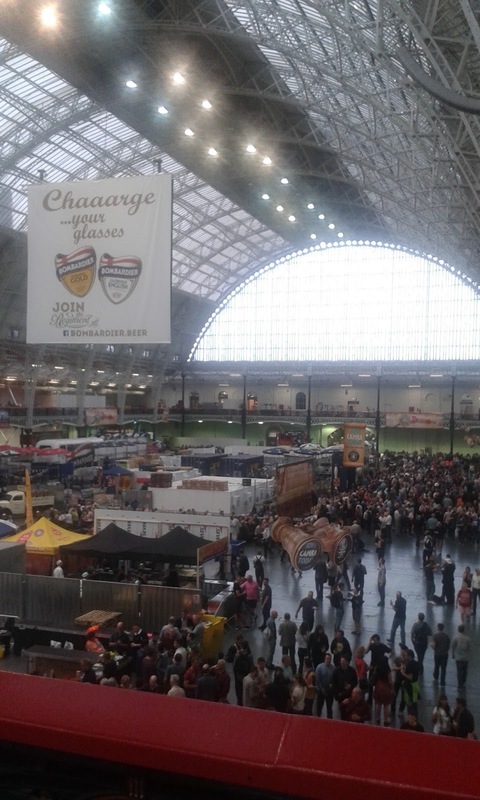 Have you ever been to a beer festival?